Henry Holt and Co. (BYR), 9781627790260, 176pp. 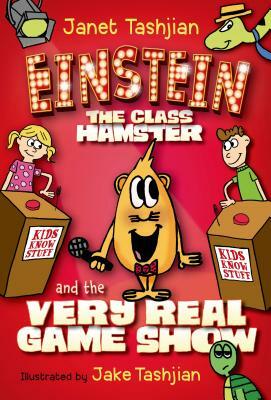 In Einstein the Class Hamster and the Very Real Game Show, the companion to Janet and Jake Tashjian's Einstein the Class Hamster, we follow Ms. Moreno's class as they face off against the students of Crackerjack Elementary on the hit game show Kids Know Stuff. But when Principal Decker sneaks Twinkles the python into the studio, there's widespread panic; the show's host is afraid of snakes and walks off the set. Now is Einstein's chance to shine! With the assistance of a sound engineer who can also hear Einstein, Ned and Marlon help Einstein get ready to host the show and save the day. But something goes wrong. Does Einstein have . . . STAGE FRIGHT? Oh no! Ned and Marlon must find a way to help Einstein and win the game show. Janet Tashjian is a middle-grade and young adult novelist who’s been writing books for children for over two decades. Her first novel Tru Confessions was made into a critically acclaimed Disney TV movie starring Clara Bryant and Shia LaBeouf. The Gospel According to Larry series is a cult favorite and Fault Line is taught in many middle and high schools. Her bestselling My Life As a Book series is illustrated by her son, Jake. They also collaborated on the Einstein the Class Hamster series. Janet collaborated with fellow Macmillan author Laurie Keller on the chapter book series Marty Frye, Private Eye. Janet currently lives in Los Angeles and made her new home city the setting of the Sticker Girl series, which details the adventures of Martina who overcomes being shy with the help of her magical stickers that come to life. Jake Tashjian is the illustrator for the My Life As a...series, including My Life As a Ninja and My Life As a YouTuber. Jake also created and illustrated the Einstein the Class Hamster series. He collaborates on his novels with his mother, author Janet Tashjian. He has also illustrated several books for the author P.T. Evans. Fun fact: Jake is a visual learner. When Jake was in elementary school, he used to draw his vocabulary words on index cards. This later became the inspiration for the main character, Derek, in the My Life As series. In 2016 Jake co-founded Workshop 2.0, a non-profit foundation to train and hire other young artists on the Autism Spectrum. Jake grew up in Massachusetts and currently lives in Los Angeles. He is an avid surfer and filmmaker.